Paris Peace Agreement Cambodia is an insurance for Cambodia country. These 24 years anniversary is very crucial like every year else that Khmer Youth Association of Alberta organized it. 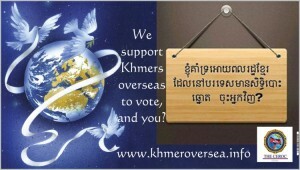 I am very glade that prominent opposition leader has repeated to join the CEROC advocacy for the participation of Khmers overseas to vote in all Cambodia elections. We should be aware that there are approximate 3 millions population of Khmers overseas and they have hugely contributed to nation-building. 1. Each year, they has sent in remittance not less than 5 millions US dollars to develop the economy. 2. Basing on principle of multiparty democratic system, all Khmer people must be encouraged to actively participate in politics particularly to choose their representatives regardless of where they are living. 3. Cambodia constitution and the Universal Declaration on Human Rights of the United Nations have guaranteed the full participation to vote of Khmer people regardless of their living places. 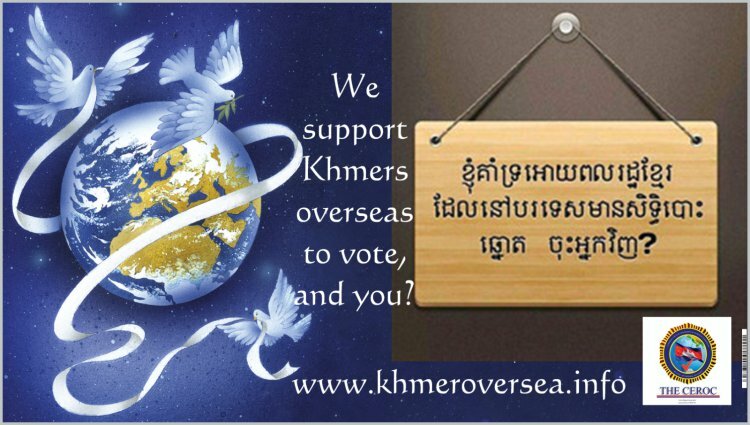 Referring above three pillars, we are convinced that Khmers overseas are able to vote in Cambodia elections but until now why those are still unable?